Spend the summer developing your project or social venture in the Purpose Lab. 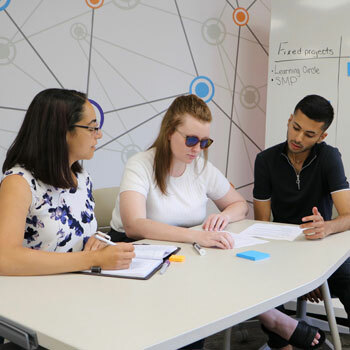 The Summer Mentorship Program (SMP) gives students who have completed a C3IL course, in a previous academic year, the opportunity to continue their projects or venture throughout the summer. As a participant in the SMP, faculty and staff will be available to support you throughout the summer and work to create a network of mentors that will help you continue to build your social venture or progress your course project. In addition to these supports, you will have the opportunity to attend a series of skills development workshops hosted by experts in social innovation, entrepreneurship, communications, marketing, and community engagement. All of the programming for the SMP will take place in the Purpose Lab, creating a network of social innovators and entrepreneurs that you can connect with in order to brainstorm ideas and discuss the future of your project or venture. Paid internship: Students who have successfully completed SE330 (CityStudio Waterloo), GG465 (Capstone in Urban Sustainability Project), or CMEG305 (Capstone in Community Engagement) will have the opportunity to apply for paid internships to continue projects developed during the academic offering. Social Entrepreneurship: Students who have successfully completed or will be enrolling in SE400 (Capstone in Social Entrepreneurship) are welcome to participate in the summer mentorship program in order to move their social ventures toward becoming profitable businesses. Students in this stream pay a nominal fee for office space and individualized mentorship opportunities. For more information, email c3innovation@wlu.ca.